With the help of KNCV Tuberculosis Foundation, Romania is stepping up their fight against tuberculosis (TB) with the launch of the E-DETECT TB Screening Programme, implemented under the national Program for Prevention, Supervision and Control of Tuberculosis in Romania (PNPSCT), coordinated by the Marius Nasta Institute of Pneumophtisiology. Every year, a thousand people die from TB in Romania, and another 16,000 are diagnosed with the disease. At 5 times higher than the European Union average, Romania has the highest tuberculosis incidence of the EU (2016). 20% of all cases reported in the EU are attributed to Romania, which accounts for only 4% of the EU population. 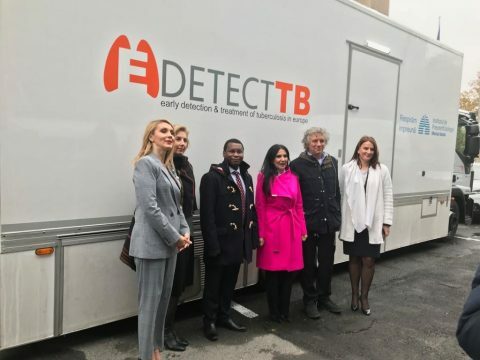 E-DETECT is the first active detection campaign in Romania using a mobile medical unit equipped with state of the art imaging and molecular diagnostic equipment and specialists who will perform radiological examinations and sputum culture tests. The initiative will bring early detection services to key targeted populations in this case inmates, the homeless, drug users and the very poor with limited healthcare services. A consortium of leading researchers and TB control experts from KNCV, University College London, and industry partners such as Delft Imaging Systems have collaborated to realize this initiative. 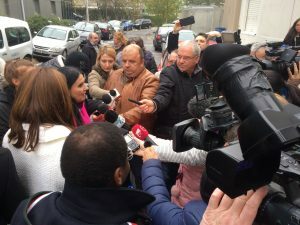 This collaboration allows European partners to deliver innovative solutions under the leadership of the Romania national TB control program and the Marius Nasta Institute. Although progress has been made in recent years in the control of TB in Romania, it remains a public health priority. E-DETECT is essential to bridge current TB service gaps for vulnerable populations, thus ending the cycle of transmission and disease.